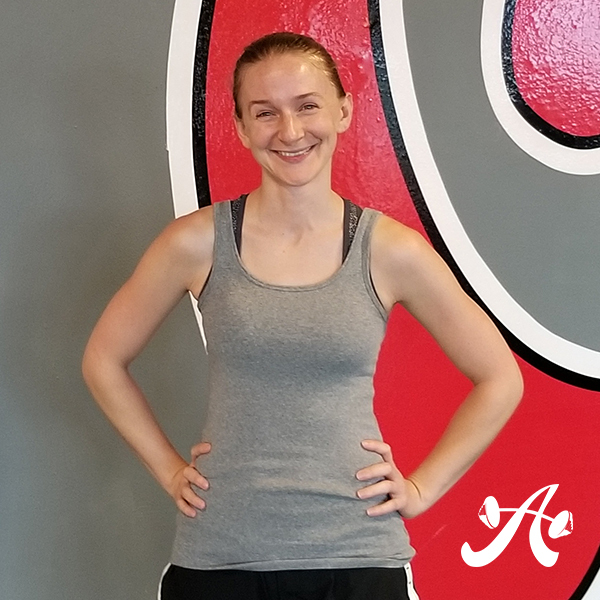 Adria originally started training with Coach Jen at in July 2018 and worked with Coach Lindsey while Jen was out on maternity leave. She’s been an amazing client and friend since she walked in the doors, and is always putting in more than in asked of her. “Adria has the most positive, can-do attitude every single time she steps into the gym. She arrives early, does her warm-up, and gives 100% during her training. She pays close attention to her form and takes care to perform the movements correctly. She’s always smiling and spreads positive vibes everywhere she goes,” said Coach Lindsey. I’m a curriculum and instructional designer at the Faculty Innovation Center at UT, and an adjunct faculty member at ACC in the Department of Communication Studies. I wanted to get into the rhythm of working out as self-care: I wanted to build muscle, and just be stronger and more fit to live the best life I can for the rest of my life. Also, I wanted to know how to work out the RIGHT way (because I’m super ungraceful and super accident-prone). I haven’t gone back to the body scanner yet so I’m not too sure about official skeletal mass, which is what I know my trainer and I wanted to focus on. But I’ve put on two pounds (this is REALLY good for me), and Jen says she’s sure that’s muscle weight coming. I can tell you, though, that working out 3X a week is becoming a rhythm, and even though it’s only been a couple of months, I FEEL better: I have more energy, my body is not on fire at the end of the day, and I feel more confident about my ability to move throughout my day. I guess I started answering that above a bit! 🙂 My partner notices a difference in my body. To be honest, I try not to look too much because I know it’s going to take awhile for me to build muscle, and I don’t want to sit there waiting for a pot of water to boil–it’ll happen eventually. Again, I’m most excited about feeling stronger, feeling less pain at the end of each 10-12 hour work day, and feeling more in balance in my life. I feel like I’m finally putting my health first, and that makes me feel lighter (less stressed) and more content. My challenges are pretty small: the two biggest are probably a sore knee and time. Unbeknownst to me, I injured my VMO muscle back in December, but didn’t find out about it until mid-August (the orthopedic guy said it’s a “patella mal tracking). Lindsey was the one that encouraged me to get it diagnosed after I was sharing with her some soreness and pain I was having in my knee during weight-bearing exercises, and Jen has since been working with me to strengthen my muscles. She even went over my PT exercises with me to help ensure I’m doing them right. She gave me some extra to do, and helped me find some of those exercise bands ASF uses to order to keep at home so I can do the exercises at home. Other than that, the biggest challenge has been time: I definitely have to hustle to fit everything into one day, but it’s totally worth it. Why do you like working out with Jen and Lindsey? They’re each so unique, and yet they both share similar qualities of being client-centered, motivating, patient, great communicators, fabulous coaches and mentors, and genuinely awesome human beings. Their energy is contagious, so just being around them is empowering. What is it about Jen and Lindsey/ASF that keeps you coming back? They made me feel a part of their ASF community so quickly. I feel like they work to empower me to know how to take care of myself. Jen recently invited me to a weightlifting competition, and I was struck by what a supportive community exists at ASF. I really value working with/spending my time, energies, and money on communities that are truly concerned with promoting the best in EVERYONE in their community. Jen and Lindsey make me feel valued, but I can tell they offer this kind of care to everyone they work with, and that’s awesome. My first and top goal is to increase my skeletal mass. My mom has RA and osteopenia, and I imagine my joint stiffness now is heading that way, so I want everything to be as strong as possible as I grow older in this life. I want to see improvements in my time on the timed activities, and weight on all of the weight-bearing exercises. I also want to see my flexibility improve. My plan is to stick with ASF. At this exact moment, I’m hooked on red apple quinoa salad at HEB. There’s a really good feeling when something that was once hard becomes easy, but don’t expect to rest on your laurels: your trainer will up the weight or the challenge to push you. It’ll feel like you’re starting all over, but if you can remember that THAT is the right rhythm of how learning works (something is difficult, then it becomes easier, then you move on to the next difficulty, etc), you’ll realize you’re getting what you really need at ASF: the knowledge and motivation to STICK WITH IT. Anything else you’d like to add about your experience at ASF or with Jen and Lindsey? Just all my gratitude. I’ve never been very athletic, graceful, or even into sports. And yet somehow, they have me wanting to deadlift 150, and I’m sure they will get me there. And then I’ll want to deadlift 200lbs. It’s hard to thank someone for helping you sleep better, feel better physically, mentally, and emotionally, AND who doesn’t laugh at you when you look like Frankenstein trying out new dynamic movements, or when you make comments about how the sled follows you like a nightmare are on your sprints.